As all of you already know my boys are crazy about anything with wheels. This layout tells the story of one very happy day...a day at the Motor Park, a place filled with cars of all shapes and sizes. You should have seen my boys' faces, all smiles and joy even when they were waiting in line. 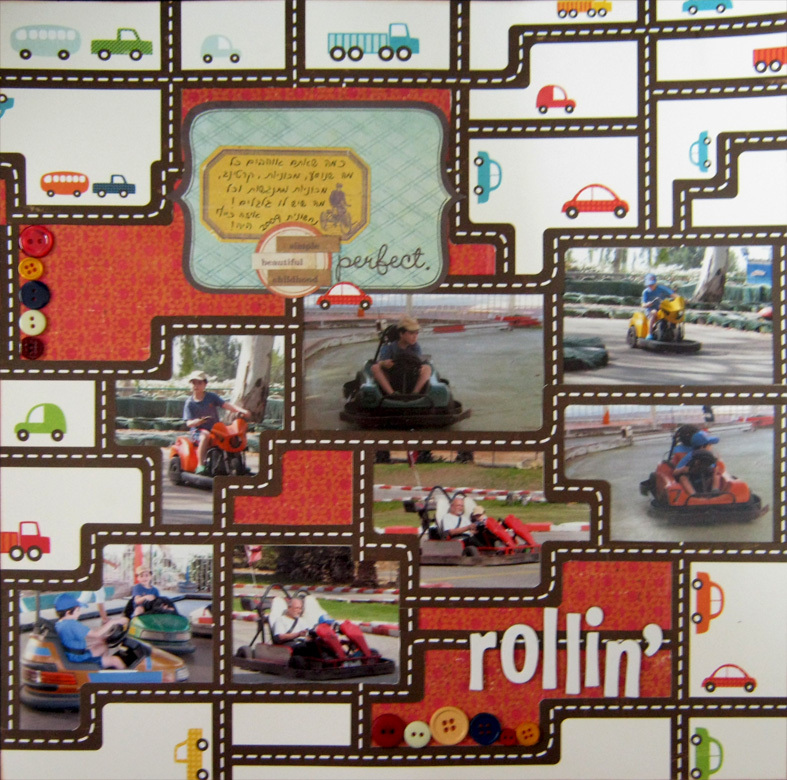 For this layout, I used the Road map paper from the little boy collection by Echo Park. This paper is so much fun! To create the windows in the paper, I cut out pieces of paper in between the roads and attached the photos on the back side of the paper keeping them facing forward. I added pieces of road strips from the cut pieces of paper where it was needed to complete the frame around the window. I added a little bit of solid color to balance the "noise" and to emphasize the photos. For the final touch I added a journaling block embellished with a small car and some words, and a few buttons in coordinating colors to counter all the squares and right angles. Try using your paper in a different way such as cutting pieces from it and replacing them with photos. Super cute layout!! You are probably getting tired of reading all my comments today! I have really enjoyed checking out your blog so far! Was wondering if you have a link button that I could add to my blog? I absolutely love all your work! Off to get some errands ran today and I will be back to check out more of your beautiful projects! Thanks again for sharing your creative talent with us! !